The MAGNA3 has acquired an EPD in accordance with the European standard EN 15804 for its life-cycle environmental impact. 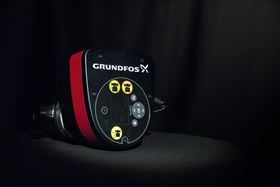 The Grundfos circulator pump, the MAGNA3, has acquired an Environmental Product Declaration (EPD) for its energy consumption, chemical substances and emissions. It is the first time any pump manufacturer has acquired an EPD in accordance with the European standard EN 15804. The third-party verified document, issued by independent assessors at the German Institut Bauen und Umwelt, icommunicates transparent, comparable information about the product’s life-cycle impact. Mark O’ Sullivan, sales engineer at Grundfos Ireland, said that the environmental impact of pumps is becoming increasingly important for customers. He cited the example of Nearly Zero Energy Buildings and an architect on an upcoming housing development project requiring an EPD for the pumps being used. The next step will be to obtain the EPD for even more products. The company said that working with EPDs and life cycle assessment influences the way it develops new products and environmental performance is considered alongside other design criteria.